Recently, 899 Squadron, the Sea Harrier OTU (Operational Training Unit), celebrated 25 years of Sea Harrier operations. In honor of the event, one of their FA.2 Sea Harriers was painted up in a scheme similar to that of which the Sea Harrier originally entered the Royal Navy. Colored Roundel Blue (instead of the original Extra Dark Sea Grey) over White, this aircraft has the full color roundels and tail markings as well as a '25 years' marking on the fin. 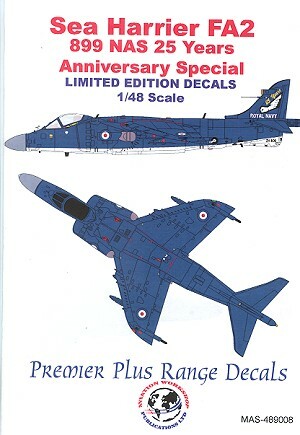 The recommended kit is the only 1/48 Sea Harrier FA.2 on the market and that is the Airfix kit. The instructions are superb providing color references for multiple paint companies as well as FS 595 and BS 381 reference shades. There are also full color four views to make sure that you get all the markings in the proper place. The decals themselves are superbly printed and if they are like other Model Alliance sheets, will be completely opaque. 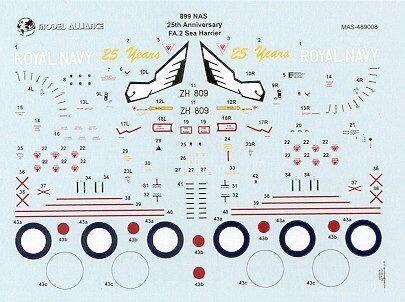 A really fine sheet that should spur purchases of Airfix Sea Harriers. This sheet can also be found in 1/72 scale. Review sample courtesy of Jon Freeman. This sheet can be found at http://homepage.mac.com/daleclarke/Aviationworkshop/ and at quality hobby shops worldwide. If you would like your product reviewed fairly and quickly by a site that has nearly 300,000 visitors a month, please contact me or see other details in the Note to Contributors.